William Ballard Doggett, better known as Bill Doggett was born in Philadelphia in 1916 and was introduced to music by his church pianist mother. He played in a combo while still in high school and went on to work with a plethora of stars in rock, jazz, rhythm and blues amassing a string of hits but, sadly, seems to have barely been noticed on this the 100th anniversary of his birth. Where is NPR at a time like this? Well, all is not lost. Fortunately his nephew and namesake Bill Doggett is doing justice to the memory of this important American musician. This younger Doggett is an archivist, lecturer, curator, strategic marketer, photographer, filmmaker, and arts advocate (his website is well worth your time). I am hardly as well prepared to provide more than an overview of this musician’s work but I feel obliged to do my small part in recognizing this man’s work. Promotional poster for the September 28, 2016 centennial celebration curated by nephew and namesake, Bill Doggett. While his last chart hit was 1961 his collaborations with Lucky Millinder, Frank Fairfax, Jimmy Mundy, the Ink Spots, Louis Jordan, Johnny Otis, Wynonie Harris, Ella Fitzgerald, Louis Armstrong, Count Basie, Lionel Hampton, Red Holloway, Clifford Scott, Percy France, David “Bubba” Brooks, Clifford Davis, and Floyd “Candy” Johnson; guitarists Floyd Smith, Billy Butler, Sam Lackey and Pete Mayes; and singers Edwin Starr, Toni Williams and Betty Saint-Clair attest to the scope of his work. Doggett continued to play and arrange until his death from a heart attack in New York in 1996 at the age of 80. The Hammond Organ is known for being the workhorse of modern classical as well as rock, rhythm and blues and jazz. It was Bill Doggett who became one of the early masters of this (then new) electronic instrument. While he was also a highly competent pianist, it was with the Hammond Organ that he had his greatest success. There is little doubt that his playing has influenced subsequent musicians who took on this instrument. The Right Choice After Hours/Ichiban 4112 (1991) Note: this is Bill’s last recorded album of original material; also released on CD. OK all you producers, have at it. A copy of this fine newly released CD was kindly sent to me for review a few months ago. First of all I must say that my delay in writing this review is due in large part to my difficulty in attempting to categorize my experience of the music. This is a very individual statement by a young musician from Greece, Panagiotis Pagonis (1989- ) who goes by the name, ‘Abstractive Noise‘ and whose work seems to be inspired by drone, minimalism, ambient, rock and perhaps classical sources as well as experimental literary narrative. This is a self-produced concept album created in the composer’s own studio and it can only be properly appreciated over several close listenings. I would categorize this release as “experimental” though not wanting to scare anyone away because this disc makes for a comfortable listening experience, not the cacophonous assault that is sometimes encountered with the term “experimental”. That said, the music develops slowly and requires some patience to appreciate the logic of its unfolding processes. The experimental literary narrative which is appended in the liner notes may be useful to some listeners but I did not connect with the mythological romantic fantasy nature of the narrative except that it provides some clue as to the passionate nature of the composer/performer and his inspiration. But don’t take my lack of connection as a negative critique. It is merely the personal experience of a fifty something reviewer listening to the product of an emerging young composer. 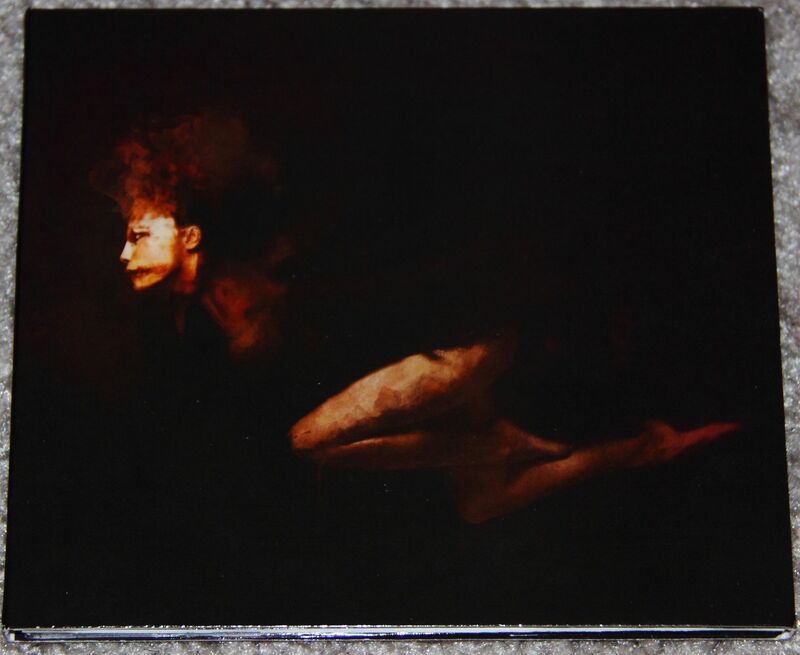 As you can see in the above photograph of the back cover and the photograph below of the unfolded package the cover art is quite beautiful and does seem to reflect some of the nature of the music within. It has a dark quality imbued with mystery and perhaps longing. It is a hybrid of musical styles which flows quite naturally from the composer’s pen (or perhaps more properly, from the composer’s various electronic processing programs which are, for many, replacing the traditional pen and paper). I am listening to it now as I write this belated review and finding that the music continues to take on deeper dimensions with repeated listens. It can actually work as well in a close listening as one would ideally do with a classical composition or in the background setting a mood. It is very well recorded with obvious careful thought put into the mastering which definitely adds to the quality of the listening experience. It is available through the composer’s web site as well as through Bandcamp. It’s not the sort of CD I would put on my car stereo but it works very well in my living room as an accompaniment to writing or just sitting. I know very little of this young artist’s background or future plans but I look forward to more from this musician. On Sunday November 17th I attended one of the most unusual concerts in my experience. 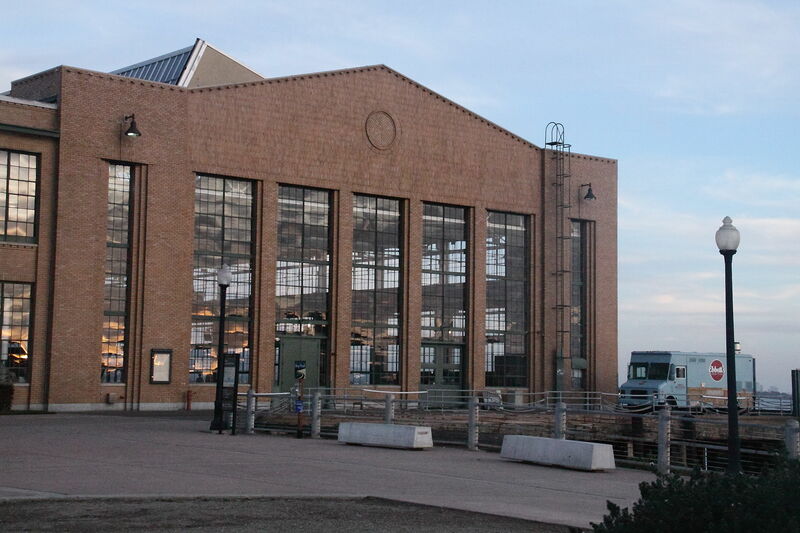 The performance of Rhys Chatham‘s ‘A Secret Rose’ at the beautiful Craneway Pavilion in Richmond was produced by Other Minds and the eclectic bay area new music bloodhound Charles Amirkhanian. Charles Amirkhanian speaking briefly to introduce the performance. 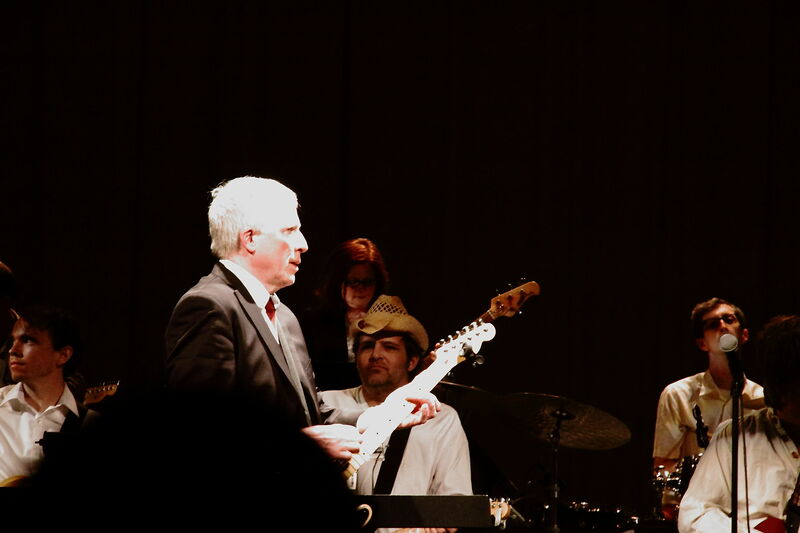 Rhys Chatham is an American musician and composer who has spent much of his career in living in France. 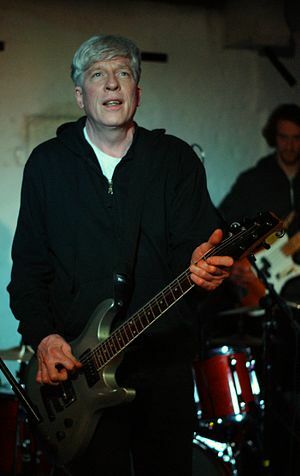 He was a part of the New York post-punk downtown music scene in the 70s working with musicians like Glenn Branca, La Monte Young and Charlemagne Palestine. 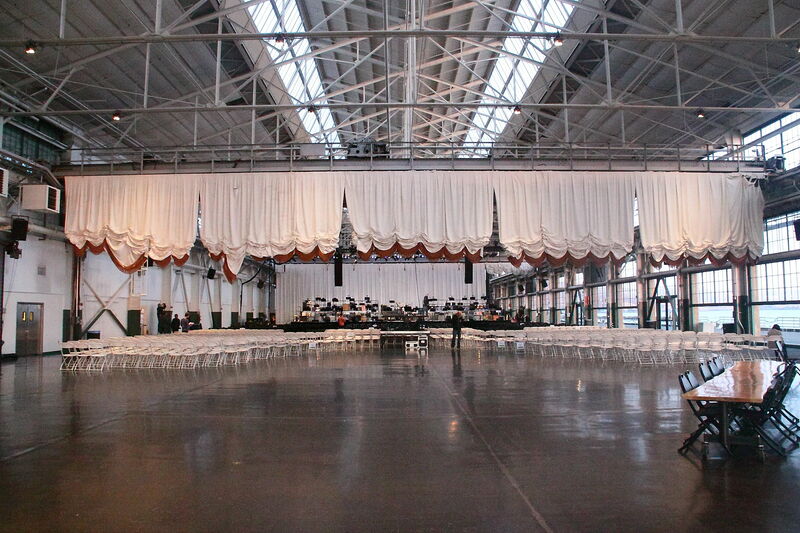 Craneway Pavilion is a 45,000 square foot former Ford assembly plant that was remodeled for use as a performance space and conference center. Its size and waterfront location remind me of Chicago’s ‘Navy Pier’ on the lakefront. Craneway is on San Franciso Bay and faces south with a view of the bay bridge eastern span as well as views of San Francisco. The appearance is that of a large loft space with metal beams and a general industrial appearance. 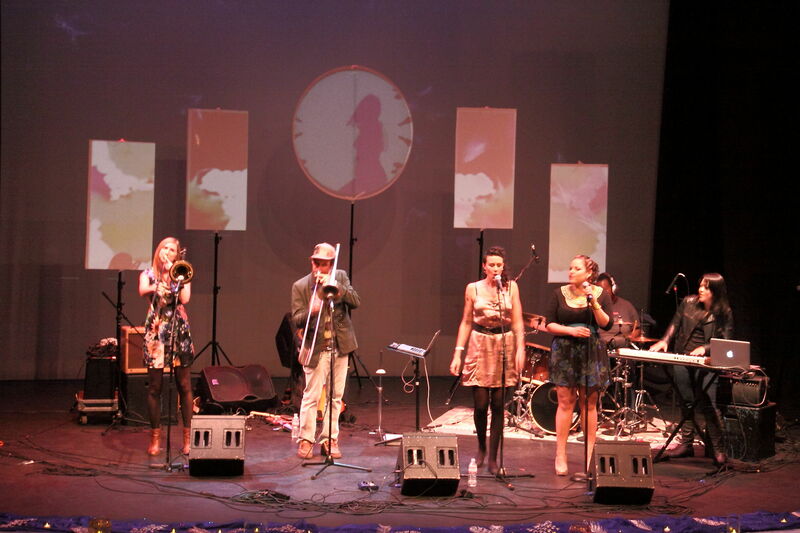 Its floor, walls and ceiling are surfaces that are highly reflective of sound and therefore ideal for this performance. 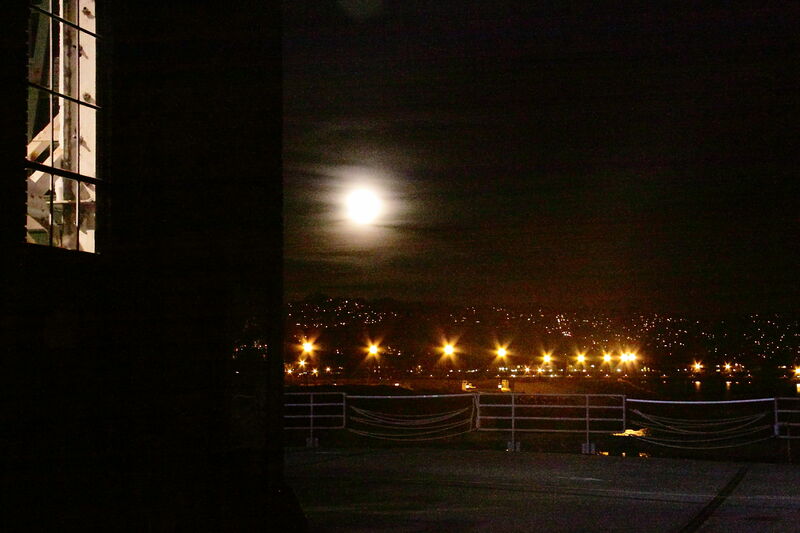 As promised in the promotional materials the full moon rose in the east over the bay before the performance began. Full Moon rising over the bay just before the performance. Looking toward the seating and the stage in the performance space at Craneway Pavilion. 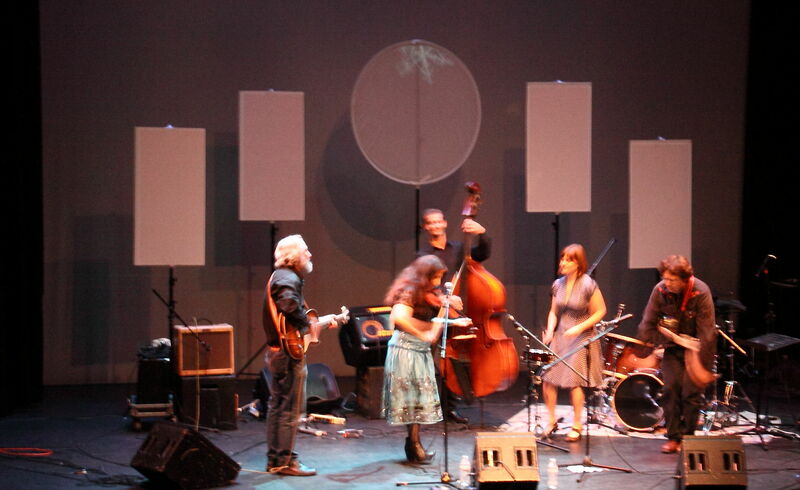 Chatham’s music was not about complexity for the sake of complexity. His compositional strategies required the complex goings on we heard on Sunday. The room itself became a sounding chamber itself amplifying, canceling and propagating the swirling harmonics that resulted from specialized tunings in addition to the other techniques mentioned. The multiple movements ranged from drone-like structures to more rhythmically complex sections and even melody. Yes, melody. 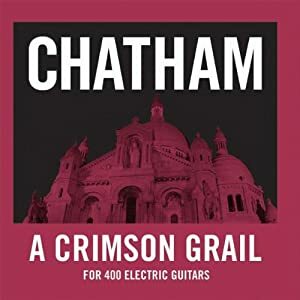 Chatham writes catchy melodies and motives that sound like they’ve been taken from one rock album or another. Sonic gestures evoked impressions of Ozzie Osbourne, Eric Clapton, and many others depending on your personal listening experiences. This music was ritual as much as expository. His techniques were not limited to rock music but extended to free jazz and classical techniques as well. Taken as a whole the piece was a multi-movement symphony, each movement sustaining its own argument in service of the whole. 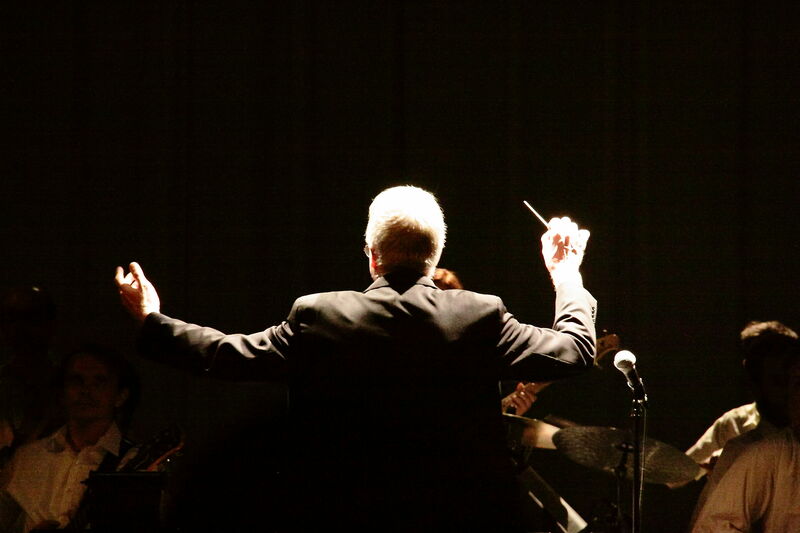 For the finale Chatham set aside his conductor’s baton and picked up his guitar, not for a solo as one might expect in an ordinary concert, but to participate in the ecstasy of performance. It is tempting, if a bit cliché, to suggest that this ritual music stirred the ghosts of the past. While standing in the ticket line one gentleman said to me, “I walked out of a Jimi Hendrix concert in 1967 because it was too loud”. 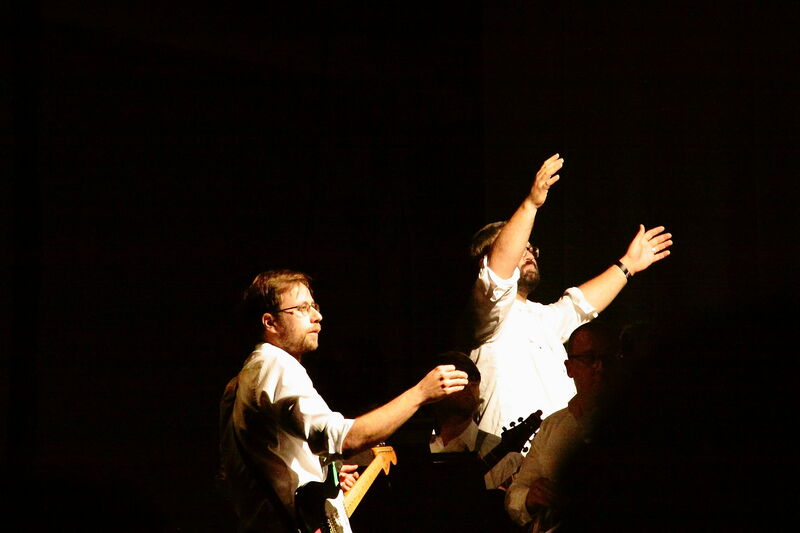 Almost immediately someone else said, “I was at that concert…”. Perhaps the Grateful Dead, Jefferson Airplane and Pretty Things were stirred from their slumbers. They were certainly evoked. I don’t know if the aforementioned gentleman ultimately stayed for the performance but I suspect he probably did, maybe in honor of Jimi. The crowd was several hundred strong ranging in age from about 5 to 85. Most appeared to be enjoying this loud and driving rhythmic composition. Some rocked or nodded to the beat. Some sat entranced and/or perplexed but attentive. 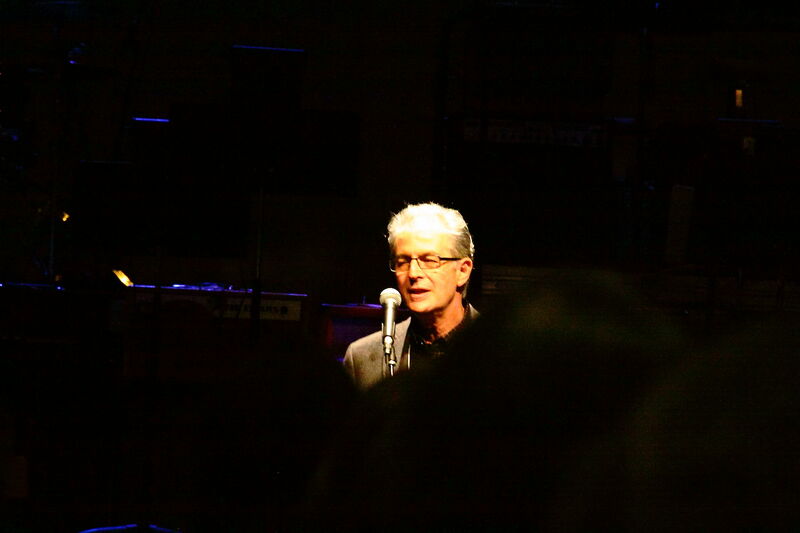 At the end there was a standing ovation and, from Mr. Chatham, a welcome encore featuring seriously de-tuned guitars. 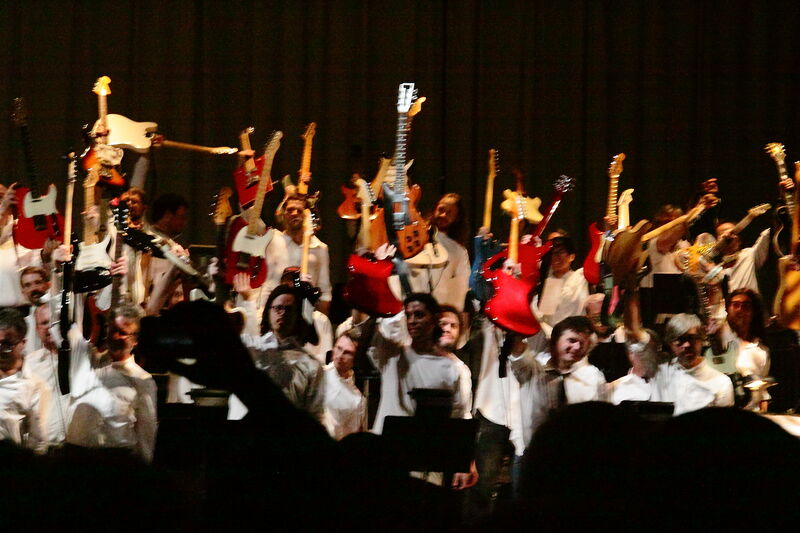 The encore piece was also captivating and inventive though certainly not as long. 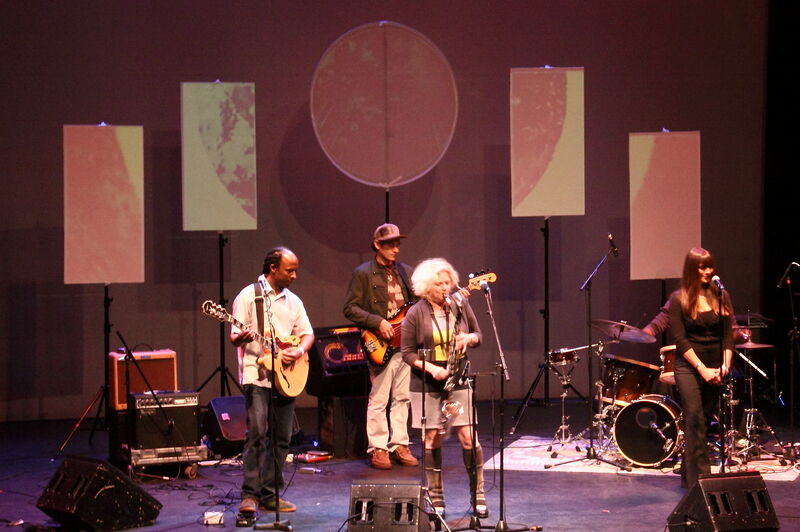 Chatham’s music is not easy to categorize or describe. Even having heard a fair amount of his music on recordings over the years I could not have anticipated what I heard at this concert. I now understand how some music cannot be adequately represented even by our best recording technology. The implicitly condescending appellation “Guitar God” has been perhaps somewhat jealously applied to virtuosic guitarists in various popular rock bands. Whether your taste runs to Eric Clapton, Jimmy Page, Jimi Hendrix or Eddie Van Halen you cannot discount the technical skill of these and so many other rock/pop guitar players. Rock and pop artists have distanced themselves from the classical music circles who initially disdained and even condemned their work. But that did not and does not mean that they eschew classical music. Many were initially schooled in classical performance technique and/or were provided a favorable view of some classical masterpieces. Ian Anderson’s group ‘Jethro Tull’ utilized a movement from a Bach Lute Suite (taking a few rhythmic liberties) in their piece, ‘Bouree’. Roger McGuinn of ‘The Byrds’ acknowledged channeling Bach when he created the now instantly recognizable intro to their version of Bob Dylan’s ‘Mr. Tambourine Man‘. Rick Wakeman, keyboardist of the band ‘Yes’ as well as a solo artist peppers his work with snippets of classical melodies no doubt learned in his piano lessons that served him so well. Keith Emerson of ‘Emerson, Lake and Palmer‘ went as far as to write a piano concerto. Leonard Bernstein, no stranger to popular musical theater, embraced rock and blues including such ensembles alongside the orchestra in major works such as his ‘Mass’. Similar, though less successful collaborations occurred when symphony orchestras were added to the production of albums by the likes of ‘Deep Purple and, more notably, ‘The Moody Blues’. Many such collaborations have been and occasionally continue to be attempted but the end result most often appears to keep the division between classical and ‘pop’ rather separate. That is not necessarily a bad thing either. Philip Glass‘ work appears to have been pretty heavily informed by rock music. He played piano in a couple of tracks on one of the New York punk rock band, ‘Polyrock’. The driving rhythms of rock are endemic to much of Glass’ music. Steve Reich’s work as a jazz drummer seems to be evidenced in his intricate use of rhythm patterns in his music. So while ‘pop’ musicians incorporated some of their classical training and influences and ‘classical’ musicians acknowledged and collaborated with their pop counterparts the classical aspects remained for better or worse more decorative than organic. Jazz became an organic part of many classical works starting in the 1920s. And, as mentioned before, rock influences have certainly found an organic role in the music of Philip Glass and, more recently in the music of Michael Daugherty. 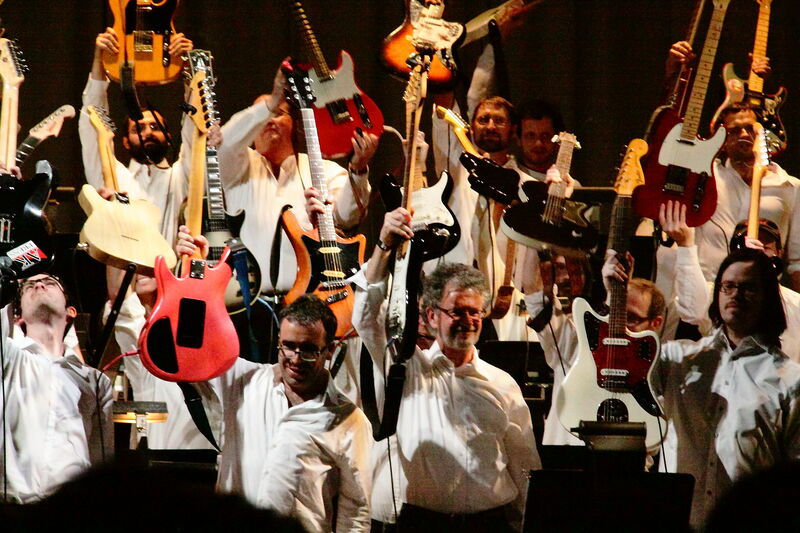 Along came Glenn Branca, Rhys Chatham, Jeffery Lohn and their various collaborators. These musicians with strong roots in rock music began to explore what has become, in this writer’s opinion, the epitome of the organic implementation of classical music into the ‘pop’ medium. Using primarily guitars (in ever-increasing numbers) as well as drum kits and the usual accoutrements of rock bands these musicians began writing music that is definitely not pop or rock (neither does it actually resemble classical at times). Branca who had worked with Jeffrey Lohn began writing his Symphonies in the 1970s. They now number 12 or 13. Working with multiples of guitars, modified keyboard instruments, alternate tunings and basking in the glory of loud he has created an arguably classical set of works grown out of clearly rock/pop beginnings. 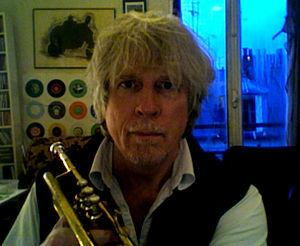 Rhys Chatham, a trumpet player initially, worked with Branca and Lohn for a while and began to develop his own classical path within the rock ethic. Beginning with Guitar Trio (1977). And continuing into increasingly massive multiple guitar works he has created another distinct set of works that are clearly not rock or pop. He does not use the classical form titles like ‘symphony’ favored by Branca but these pieces like, ‘An Angel Moves Too Fast to See’ and ‘Crimson Grail‘ feature large numbers of guitarists which by necessity must be locally sourced. Even without classical form or titles these are clearly not pop or rock pieces. And perhaps they can’t be called classical either but they are certainly of symphonic proportion. Both Branca’s and Chatham’s works have been recorded and I highly recommend the recordings. But these musics cannot be fully captured by current recording technology. The acoustics of the space in which they’re performed and the volume levels which elicit their own effects are best experienced live because of the volume levels and also because of the overtones which are elicited by the instruments in the performing space and more audible because of the overall volume and the characteristics of the listening space. 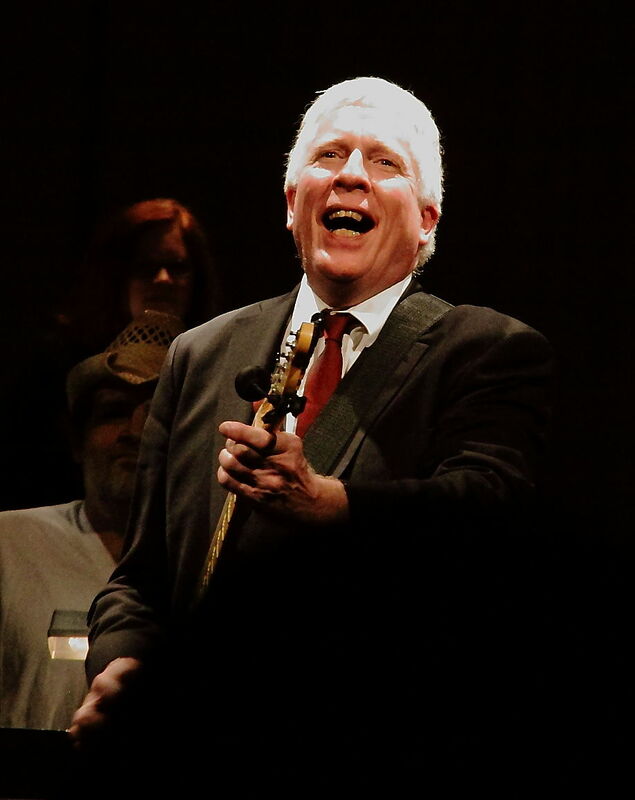 Such a rare opportunity awaits Bay Area audiences this November when Rhys Chatham comes to town under auspices of ‘Other Minds’ and the delightfully insightful and eclectic producer Charles Amirkhanian. 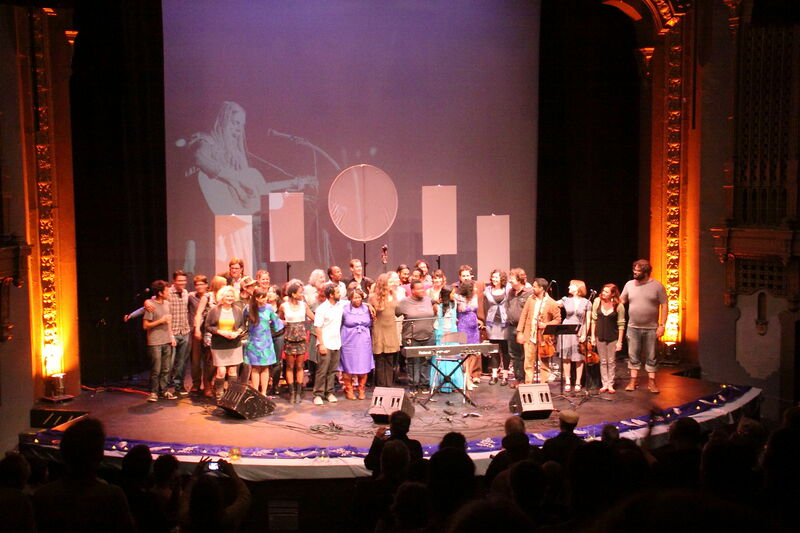 They have engaged the architecturally and sonically fascinating space of the Crane Pavilion in Richmond (a few miles north of Berkeley and Oakland) with sweeping views if San Francisco Bay and enlisted many locally sourced musicians to produce the west coast premiere of Chatham’s “A Secret Rose” (2011) for 100 guitarists. 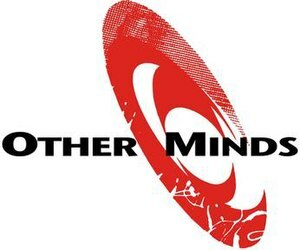 Tickets can be purchased through the Other Minds website (www.otherminds.org). This is a rare opportunity to hear a uniquely different music in a visually stunning and acoustically interesting space. Hope to see you there. The practice of “covers” in pop music is part of the long tradition in music of making arrangements, variations, homages, etc. in response to a given composition. To be sure the majority of these efforts are, though well-meaning, mediocre or worse. But on the whole they can be quite fascinating and even revelatory. Ravel’s masterful orchestration of Mussorgsky’s ‘Pictures at an Exhibition’ is so well done that few people are even aware that the original is a piano solo work. 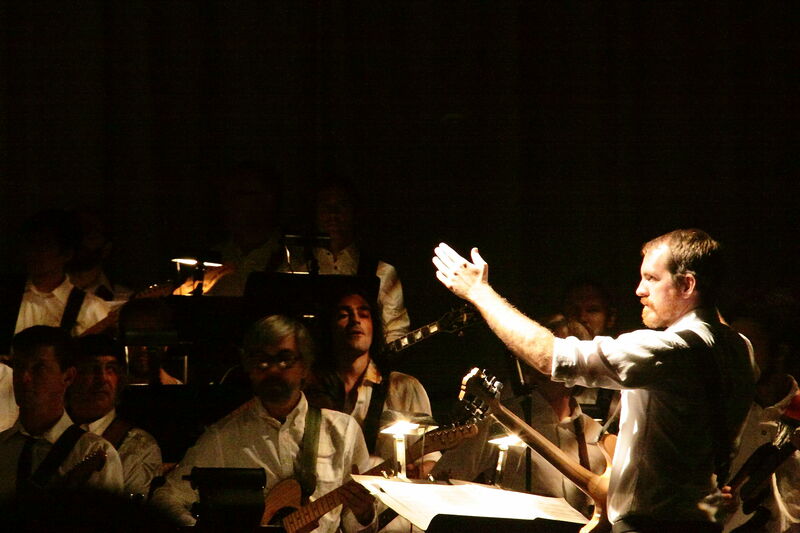 The orchestration so enhances the original as to immortalize it and upstage the original version. Similarly The Byrds’ cover of Bob Dylan’s ‘Mr. 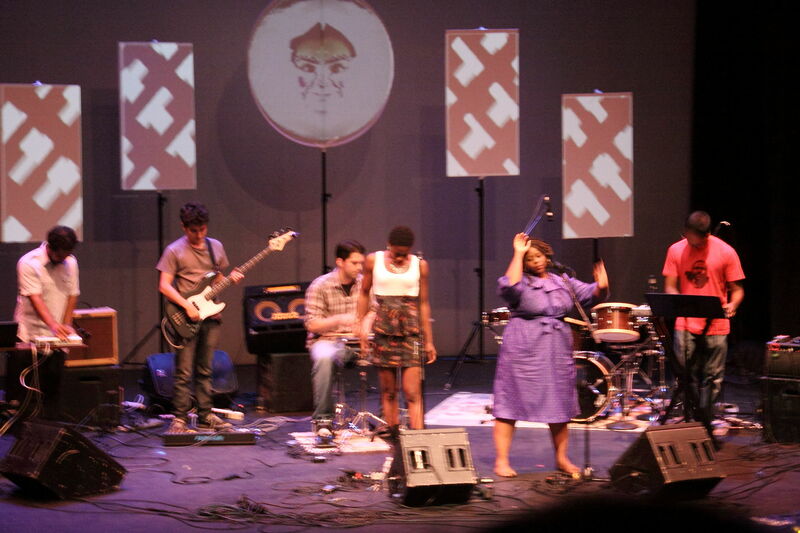 Tambourine Man’ has become the most recognized version of that song. 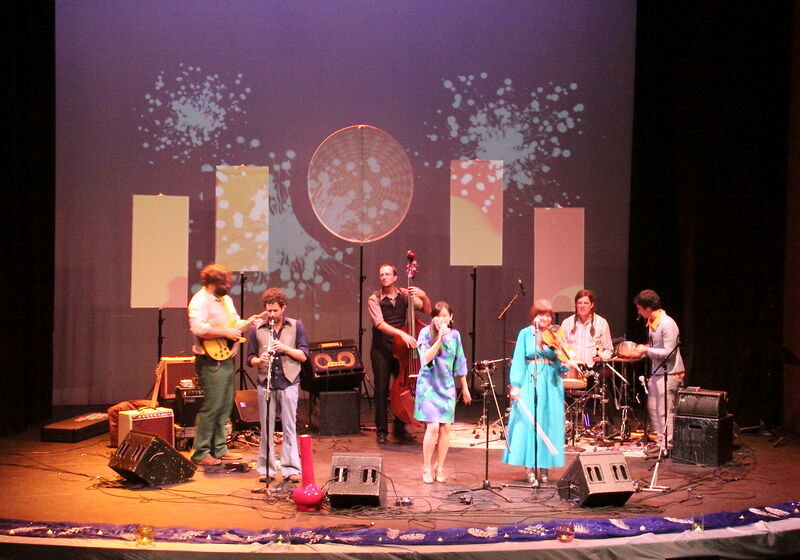 The first band, ‘Killbossa’ is inspired by the Brazilian art/music/political movement of the late 1960s known as ‘tropicalismo’ and is a combination of a variety of different musical styles including bossa nova, psychedelic rock, avant-garde and Brazilian popular music. They covered the first song on the album, ‘All I Want’. 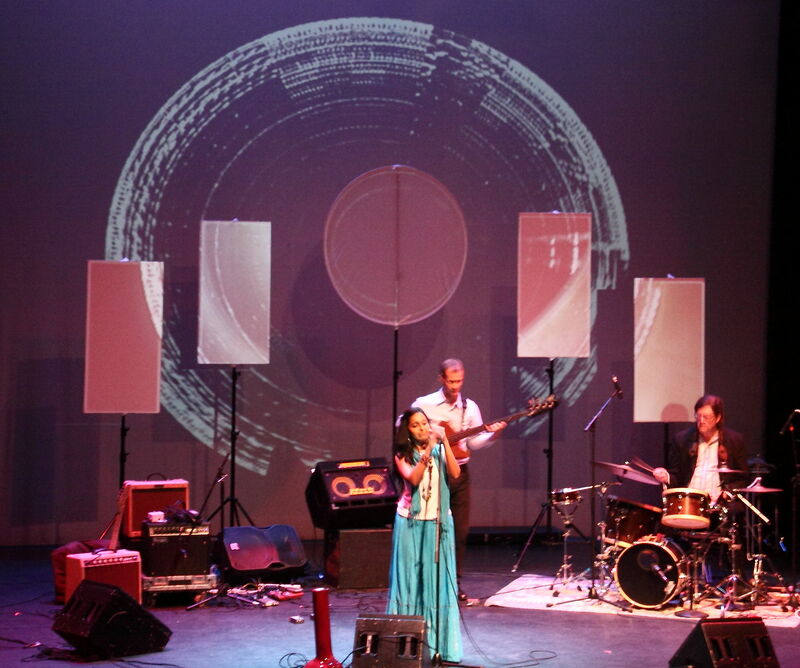 Next up Bharathi Palivela, a singer with traditional Hindustani vocal training teamed up with San Francisco bassist and teacher Daniel Fabricant covering ‘My Old Man’. Georgia native, now San Francisco based bluegrass singer with her banjo and band put their spin on ‘Little Green’. ‘Carey’ was given a reading by clarinetist, vocalist Beth Custer with her strongly jazz inflected ensemble. 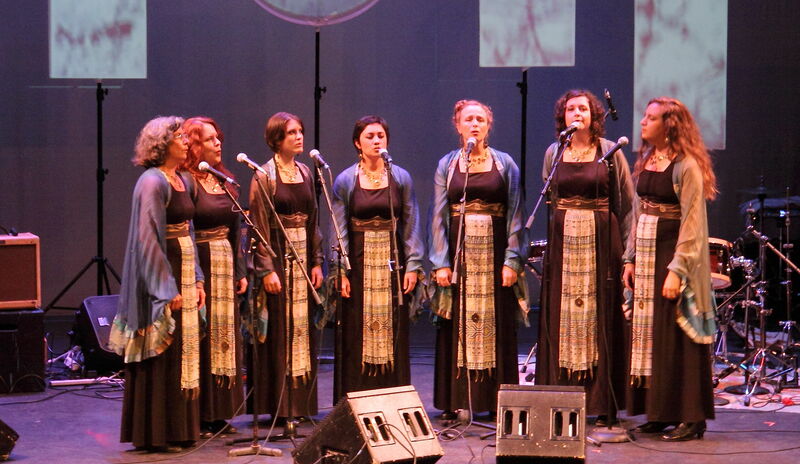 Kitka is an all female a capella group specializing in eastern european style folk singing. Their a capella cover of ‘Blue’ was alone worth the price of admission. 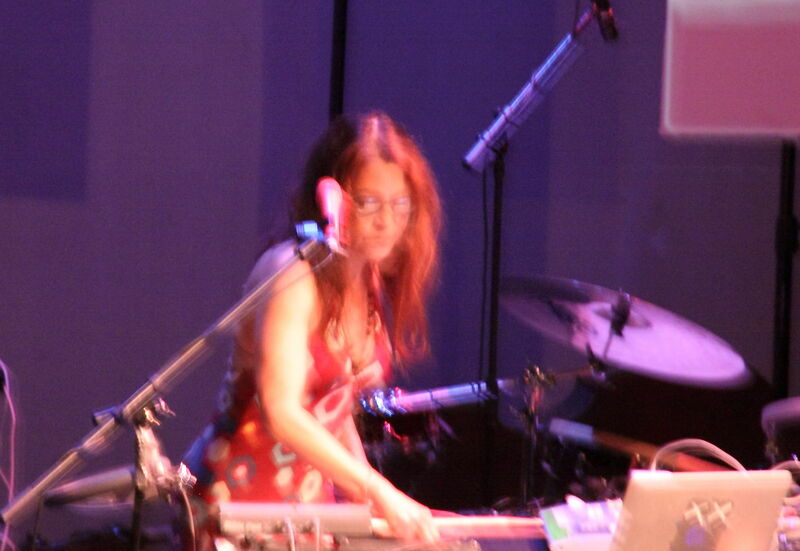 Amy X Neuberg is an Oakland based singer, performer and tech wizard. With her voice and electronics she created a unique version of ‘California’. Jazz/funk/hip-hop/R and B Jazz Mafia with Aima the Dreamer and Erica Dee did a raucous version of ‘This Flight Tonight’. Cajun/blues/southern fiddler and singer with her band did a country blues version of ‘River’. 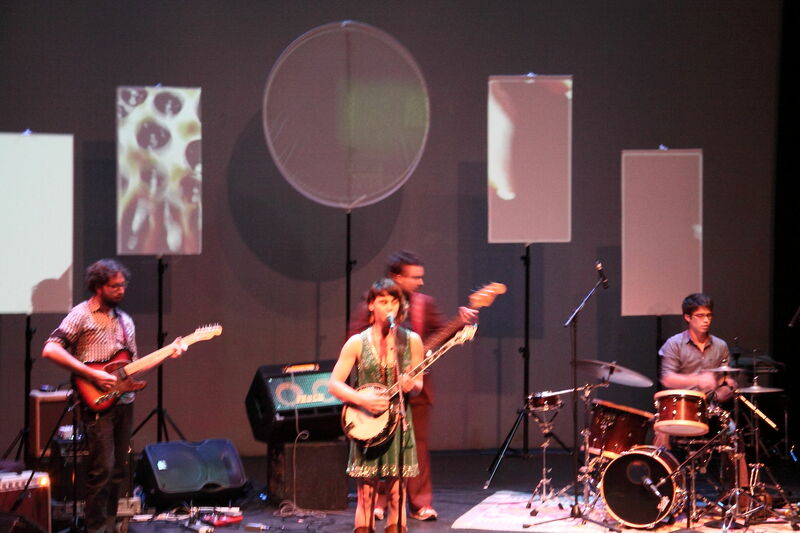 The Seshen is an electro-pop ensemble that, like the other musicians in this show, is hard to categorize. They did an ecstatic cover of ‘A Case of You’. 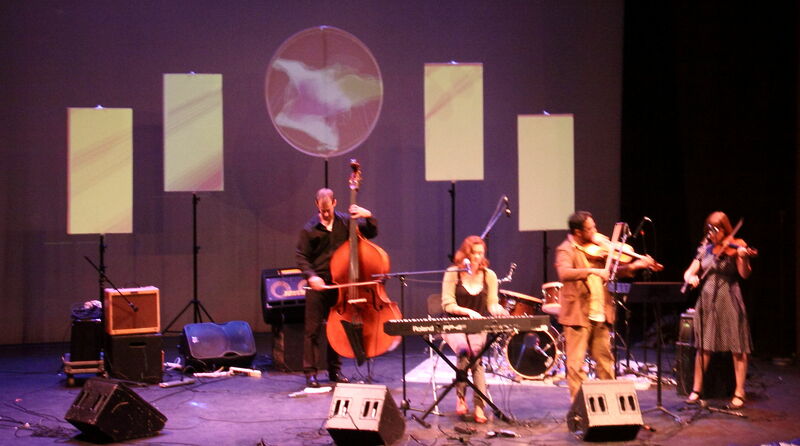 Katy Stephan and her group Classical Revolution ended the evening with ‘The Last Time I Saw Richard’. 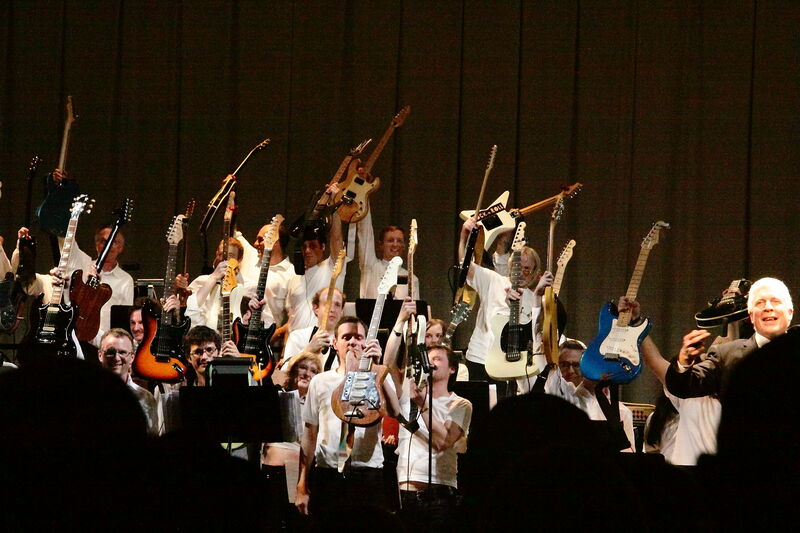 All the musicians barely crowded on to the stage to acknowledge the standing ovation from the very appreciative crowd. Whether you know the original Joni Mitchell album or not you can’t fail to find something exciting, eye-opening and enjoyable in these performances. The range of creativity and talent is staggering. The bands played with a subtle but effective visual display that unified their efforts and added another aspect to both the music and the performance. I’m sure Joni would be pleased. Did I say that the ticket price includes a free download of the studio album? Well it does and it serves as a great reminder of a truly unique bay area experience. Maybe I’ll see you there.